A blog dedicated to antiquarian books and other aspects of bibliophilia, with a smattering of musings about natural history, science, technology, fossils, classical antiquity and literature. This blog expresses personal opinions only, and does not necessarily reflect those of my employer, or, indeed, anyone else. NT Wrong, Biblical Studies, and Autobiography. So after two inactive years, I've decided to reactivate my blog. This post is something I wrote about four years ago and never published, but enquiries made today on Twitter by @Dr_Black about surviving difference engines made me drag it out. Johann H. Mueller, (1746-1830) began making calculating devices in the 1780s, and it was he who conceived of the idea of calculating and then printing mathematical tables. Evidence now suggests that Charles Babbage, who started thinking about calculating machines in the 1820s, was influenced by Mueller. However, neither Mueller nor Babbage were able to construct a successful machine. Babbage described his Difference Engine No. 1 in his publication A Letter to Sir Humphry Davy... on the Application of Machinery to the Purpose of Calculating and Printing Mathematical Tables. London, 18221. However, an attempt at construction ground to a halt after some 25,000 parts had been assembled, and it was never completed. By 1834 Babbage had conceived of a far more complex machine, Difference Engine No. 2. This too was never completed in Babbage’s lifetime2, and once again, Babbage intellectually moved on, conceiving of an even grander project, his Analytical Engine. While the Difference Engine was intended to calculate mathematical tables and print the results, the far more ambitious Analytical Engine was designed to execute any mathematical operation by following a program on punched cards3. Meanwhile in Sweden, Georg Scheutz (1785-1873), publisher, translator and inventor, read an article on Babbage’s Difference Engine in the Edinburgh Review4. Stimulated by this, he conceived of his own version of the Difference Engine, but decided to concentrate on the output, i.e. the printing of the tables. In this he was radically different from Babbage. Scheutz’s original design was realised by his son Edvard, who in 1837, at the age of 16, offered to build it. Working in a workshop at home with a lathe and a few other simple tools, the engineering student managed to complete a functioning machine by 1843. This was the world’s first fully functioning mechanical calculator, and it was complete with a printing unit for output5. This machine was tested by the Swedish Royal Academy of Sciences under the watchful gaze of the famous chemist J.J. Berzelius, who testified favourably on its construction and function. With this endorsement, the Scheutzes attempted to obtain orders from several European countries, but in vain. The British Treasury declined on the grounds that they had already expended a huge amount of government money on Babbage’s designs6 and could not invest in a foreign invention. In the end, the Swedish government gave the Scheutzes a grant for further development. J.W. Bergström’s engineering workshop in Stockholm constructed the Scheutzes’ second difference engine, completing it after only a year’s work, in 1853. This was a far more complex machine. Whereas the first difference engine used five decimal places and three differences, this new model used fifteen places and four differences. The Scheutzes applied successfully for a patent for this second machine at the London Patent Office in 1854. This calculator won a gold medal at the Universal Exposition in Paris in 1855, and was later sold for use in the observatory at Albany, New York. It is now on display at the National Museum for American History. A third machine, built by Bryan Donkin’s mechanical workshop in London in 1859 was used for many years at the Registrar’s office for calculating and printing statistical tables. This is now on display at the Science Museum, London. Christie's New York, Feb 23, 2005, lot 16, $32,000; Sotheby's, Mar 20, 2003, lot 385, £7,000; Swann, Apr 19, 2001, lot 165, $8,000; Bloomsbury, Oct 28, 1999, lot 15, £5,500. 2 The Science Museum in London completed the build in 1989-91 using Babbage’s plans and engineering at 19th century tolerances. 3 This was first reported by Luigi Federico Menabrea, which was in turn translated by Ada Lovelace and published in England in 1843. 4 Dionysius Lardner, “Babbage’s Calculating Engine” in Edinburgh Review, 59 (April-July) 1834, pp.263-327. 5 This machine was rediscovered in 1979 after it had been lost for 100 years. Michael Lindgren, while completing a study of the Scheutzes noted that in the inventory of the estate of Edvard, it had been deposited in the Nordiska Museet. Lindgren found it in the storehouse of that same museum still in its original mahogany box. 6 Babbage received some £17,000 for the development of his designs; a steam locomotive in the 1840s cost roughly £800 to build. After my last blog post, here's news of one library that's deaccessioning properly. The Natural History Museum, South Kensington, has consigned a quantity of books, mainly runs of periodicals and journals to Christies South Kensington's sale of Travel, Science & Natural History onThursday 15th October. The items chosen to be sold are duplicate material or titles outside the scope of museum collections. All the books were offered free of charge to other research and academic libraries before being identified for sale. Any money raised from the sale will be used to purchase new items for the NHM Library collections. All the lots (225-245) are being sold without reserve, with all faults, and not subject to return. Their provenance is indicated externally by the Museum's various departmental library gilt stamps to the spines and small archival classmark labels, and internally by the usual ink stamps (together with their deaccession counterparts.) These latter are usually confined to just the preliminary leaves, titles, and versos of plates, are not greatly obtrusive, and are only mentioned in the following descriptions if they greatly affect condition. Some of the lots display provenances other than the Museum. For example, there are a number of books (especially the microscopical lots) from the Heron-Allen collection. 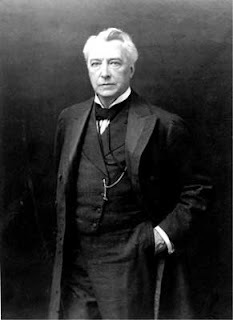 Edward Heron-Allen (1861-1943), lawyer, classicist, musician, historian of the violin, cheiromancer, linguist and translator of the Rubaiyat of Omar Khayyam, military intelligence officer and foraminifera expert, built a library containing some 12,000 volumes at his home at Large Acres, Selsey Bill, Sussex. After his death, the natural history portion was bequeathed to the Natural History Museum, together with his slide collection 'one of the two most important type slide collections of recent foraminifera extant in England' (ONDB). Lots with a Heron-Allen provenance include three scarce runs of microscopy: 234, an extremely rare and extensive run of the Journal of the Quekett Microscopical Club; 235, Journal of the Royal Microscopical Society; and 236, Transactions of the Microscopical Society of London. There's also the oldest scientific periodical in French, Annales de Chemie (with 10 papers alone by Pasteur, including his landmark experiments on fermentation), a very rare set complete set of Lorenz Friedrich von Crell's periodical publications, the sought after Entomologist, an extensive run of Nature (including the Crick & Watson DNA papers), as well as Obituary Notices and Biographical Memoirs of the Royal Society, which includes Alan Turing's obituary. There's much more in the same sale, not only NHM material, but a also a wide range of other books, including some rare geology. I'll save that for another post. Many apologies not not posting lately, but some very interesting devlopments have been happening at work. One of these includes coming across a very rare book indeed. It is Henry Bradbury's first nature-printed work from 1854, and includes 21 colour-printed nature-printed plates in a printed portfolio wrapper. I will be posting more details on this book later, but in the course of researching it I came across some rather unsettling (to put it mildly) library news. The book itself seems to be related to a patent application by the publishers Bradbury & Evans, and thus I contacted Steve van Dulken at the British Library (see his excellent blog on patents here) for more details. He said that for conservation reasons the British Library no longer permits photocopying of patent specifications pre-1900, but that I should contact Leeds Patent Library. Thus I duly did, and it turns out that in 2004 Leeds Patent Library had to move offices and were unable to hold their hardcopies of patents. Therefore they gave them away (for free!) to Univentio, a Dutch company mainly interested in current British patent applications, with the proviso that the older ones would eventually be digitized. In 2005 Univentio was taken over by LexNexis, who had no interest in this at all, and apparently all of the hardcopy Leeds patents have now been dumped. As a tax payer I cannot quite believe financial incompetence of giving away public assets for free; as a researcher and historian I cannot believe that we gave away our heritage for free. Unbelievable - especially as it is possible to make a living by selling such a collection; just ask Maurice Stroh. Of course one shouldn't necessarily be surprised. Nicholson Baker has documented at length what he calls "Libraries and the Assault on Paper" in his excellent book (and must read for anybody interested in books) The Double Fold. There is a happy ending. Leeds referred me to Sheffield Patent Library There, an extremely helpful lady by the name of Paula told me that Sheffield still had all their patents in hardcopy. They are stored offsite, and library staff make a journey twice a week to get the relevant material. They will photocopy the relevant patent application for you for the princely sum of £1.50 handling fee and 20 pence per page. 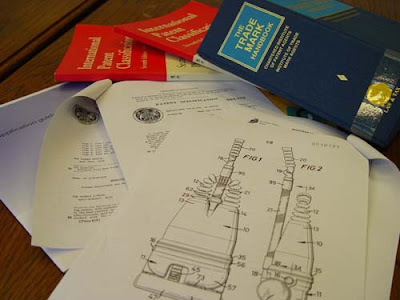 I will be receiving my requested photocopies of Bradbury & Evans' nature-printing patent application in the post in the next day or two (Royal Mail strikes permitting). Now that is a public service well worth paying for and well worth keeping. Sorry, the previous post contained two errors. Firstly, the sale of Old Master, 19th century & British Drawings & Watercolours that contains the Dodo drawing is actually being held at South Kensington, 85 Old Brompton Road, London, SW7 3LD. You can see the whole of sale 5979 here. Secondly, the estimate has been revised and is now £5000-7000. Many apologies for being silent for so long, but a combination of work and holidays has kept me from the blogger's keyboard. This previously unpublished drawing of a dodo is an important and exciting addition to the known images of this iconic extinct bird. 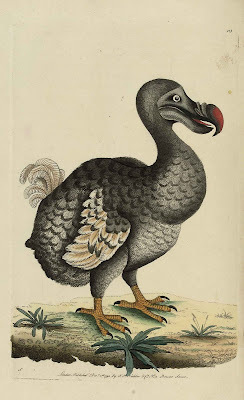 First recorded by Dutch mariners who explored Mauritius in the last years of the 16th century, the dodo was extinct by 1700, and has fascinated the popular consciousness ever since. Early images, which are extremely rare, can usually be linked to one of a handful of prototypes. However, this characterful study has no relation to any of the known visual sources. It rivals in vivacity the representations by Jacob Hoefnagel (circa 1610; National Library of Austria) and the head study, possibly from life, by Cornelius Saftleven (1638; Boymans Museum, Rotterdam) (E. Fuller, Dodo: From Extinction to Icon, London, 2002, pp. 80-81, 111). The possibility that the present drawing was also sketched from life, while unlikely, cannot be completely discounted. Live dodos are known to have been transported from Mauritius as curiosities. A dodo was recorded at the menagerie of the Mogul Emperor Jahangir in about 1625 (Institute of Oriental Studies, St Petersburg; Fuller, pp. 94-5); and, in about 1638, Sir Hamon L’Estrange saw a live dodo exhibited in London (Fuller, p. 69). The present drawing is unusual, however, in the lightness of the plumage. It has some similarities to the colouring of the bird shown in a watercolour by Pieter Holsteyn (Teylers Museum, Haarlem), dating from the 1630s. Traditionally called the White Dodo of Réunion, the bird in the Teylers Museum drawing is now thought to show an albino dodo (Fuller, p. 170), which may also be the case in the present drawing. 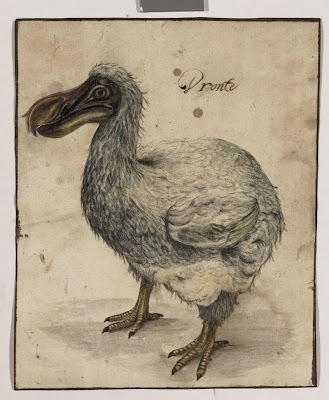 The inscription on this drawing, ‘Dronte’, was the Dutch 17th-century name for the dodo, although at this period it was also used in a number of other languages including French and Italian. The drawing is being sold at Christie's King Street South Kensington, London, on 9th July. A full catalogue description can be seen here, and is estimated at £4000-6000 £5000-7000. I'm often using Worldcat to check library holdings of antiquarian books. As a resource it's pretty amazing, and when I saw that I could run it on my mobile, I thought this would be even more wonderful. And it is .... up to a point. Boopsie is a mobile search provider. However, we like to call it mobile find - because Boopsie finds things, it doesn't search for them. The Boopsie client is a thin, yet powerful, layer between you and what you are trying to find. Boopsie does not 'contain' the data; it creates and uses special indexes to find the data on other content providers' sites. So I downloaded the Boopsie Worldcat client onto my Blackberry Pearl 8100 (yes, I know that I'm one of the clerical workers of the world, thank you Mr Hockney). First little snagette is that you actually have to download two Boopise apps: one is the Boopsie main application; the second is the dedicated Worldcat interface. As a result two icons appear on the Blackberry display. Clicking on the Worldcat icon opens up a screen with a search line at the top next to an icon that flickers between a blue search 'magnifying glass' and a red satellite dish. The point of the dish is that the Worldcat app is meant to pick up the GPS signal from the Blackberry's position and be able to tell you how far you from the nearest library where it's located the book you're looking for. Cool eh? Err, no. Here's the first problem. I live and work in London, but for some reason it thinks I'm in Seattle, WA. You can manually change your location, but only you can only change it to Londons in the USA or Canada. Why, therefore, is it called Worldcat? I would understand this if it thought Boston was in Massachusetts rather than Lincolnshire, but really... It works fine on the main website, Worldcat even knows how to find and position British postcodes, but obviously it's Boopsie that has the problem. Google Maps, incidentally, works like a dream on my phone, and seems to instantly pick up my position everywhere I've ever been with it, whether that's in the New World or the Old. Unfortunately, the second flaw is generated by one of Boopsie's strengths. The idea behind Boopsie is to create a fluid searching experience using minimal keystroke entry to gain results. (Boopsie's own example is that to find 'jacqueline kennedy onasis' in Wikipedia, one only needs to type 'jac k o'.) But with antiquarian books, this doesn't really work because you drag up hundreds of inconsequential entries too, so the usual maximum keystroke entry is required. In fact, I now start my searches with a date to minimise the junk returns. Then there's yet another flaw. The search returns pop up nicely in the Worldcat app, but to see extra detail, it loads up each entry into the Blackberry's web browser. So now you're effectively running two apps and swapping from one to the other is a bit of a faff. Still, I think these are little quirks that can be lived with to get the power of mobile research through the world's largest library resource. Welcome to the first Bibliopole posting. Since my life normally revolves around items of varying antiquity, I thought, in a twist on the old axiom of adapt or die, I'd better jump on the technology bandwagon in order to promote the ancient. 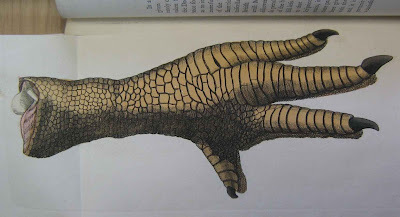 What better first posting then, to discuss the Dodo; and moreover, the missing foot of said extinct bird. In Robert Hubert's Catalogue of Many Natural Rarities, 1665, a dodo's foot appears in the inventory as 'legge of a Dodo'. The leg here preserved [at the Royal Society] is covered with a reddish yellow scale. Not much above four inches long; yet above five in thickness, or round about the joints: wherein though it be inferior to that of an Ostrich or Cassoary, yet joined with its shortness, may render of it almost equal strength. can it be possible that an Albatross, (Diomeda exulans Lin.) not fully grown, and inaccurately represented by a draughtsman, may have given rise to the supposed existence of the Dodo? It still seems amazing that so little evidence survives of the bird. Errol Fuller has pulled together all the evidence to show that only 16 written accounts, contemporary of the bird during its brief co-existence with humans, have come down to us; and there are only 15 original illustrations (Shaw & Nodder's is probably derived from the famous Savery picture in the Natural History Museum, London). The physical remains are extremely scant: there's the Oxford Dodo, the skulls in Copenhagen and Prague, and a rather slight assemblage of bones from the Mare aux Songes. Alas, the British Museum foot, like the species itself, is missing. Shaw & Nodder saw it in the museum, and made the only known illustration of it. The foot entered the British Museum from the Royal Society sometime during the 18th-century. 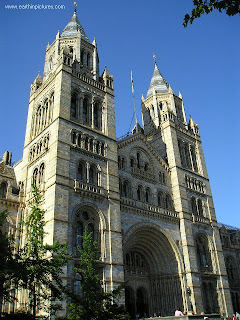 It was then moved from the museum in Bloomsbury to the new Natural History Museum site in South Kensington in the 19th-century, and within living memory was safely kept there. Sometime during the second-half of the 20th century it disappeared. As Fuller says, 'Whether stolen, accidentally destroyed or simply misfiled is not known'. Shaw & Nodder's Naturalist's Miscellany is coming up for sale in Christie's auction of Valuable Printed Books and Manuscripts on Wednesday 3 June, at 10.30am, lot 87, estimated £12,000-18,000.